Anyone who has ever opened YouTube in front of a classroom knows the feeling of dread that comes with hoping that the "related" content in the sidebar really is related content. Likewise, you hope that the "related" videos at the end of the one you're showing are appropriate for your classroom. 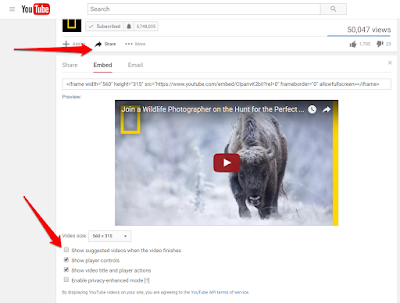 Here are five ways that you can avoid showing related content when you show YouTube videos in your classroom. 1. Put the video into a Google Slide and show it in full screen mode. This will remove all of the sidebar content. To prevent suggested videos from showing at the end of a video that you put into a webpage you will need disable the "show suggested videos" option in the embed code provided by YouTube. See my screenshot below for directions on how to do that. 2. Watchkin is a service that allows you to watch and project YouTube videos without seeing the related sidebar content typically seen on YouTube.com. Watchkin can be used in a few ways. You can enter the direct URL of a video into Watchkin to have the sidebar content removed. You can search for videos through Watchkin and have family-friendly results displayed (if a video appears that is not family-friendly Watchkin has a mechanism for flagging it as inappropriate). Watchkin also offers a browser bookmarklet tool that you can click while on YouTube.com to have the related content disappear from the page. 3. View Pure is a simple little tool that strips way all of the distractions of related videos, comments, and promoted videos. To use View Pure just copy the link of a video into the "purifier," click purify, and your video will be displayed on a blank white background. You can also install the View Pure bookmarklet to accomplish the same goal. 4. Quietube is a handy little browser extension that removes all the clutter from YouTube allowing you to view only your selected video. Quietube removes all advertising, sidebar content, comments, and ratings. Installing Quietube requires nothing more than dragging the Quietube button to your toolbard. Then anytime that you're on YouTube click the Quietube button to remove all of the clutter and just watch your selected video. Quietube works for Viddler and Vimeo videos too. 5. SafeShare.tv makes it possible to view YouTube videos without displaying the related videos and associated comments. To use SafeShare.tv simply copy the url of a YouTube video and paste it into SafeShare.tv. SafeShare also offers browser bookmarklet that eliminates the need to copy and paste links.